As a formerly incarcerated person, I have decided to do a deep-dive into OITNB to help explain some of the things that folks watching the show without a felony background might miss or might not have the context to catch while watching the show casually. Also, apologies, I had surgery last week and it knocked me for a loop. Unfortunately, a few days ago, I had a few complications and it knocked me for a loop again. Hopefully, everything is back on track now (I am feeling much better). At the end of each post, I suggest a book that I have read about our criminal justice system. 5 Things About Season 2 Episode 1 ""
So, as you might have heard, a hacker got control of most of the OITNB S5 episodes and has released all of the episodes that he has on some pirate server. I am committed to starting my Season 5 recaps as soon as the new season airs on Netflix. In other words, I will leave whatever season I am in and jump straight to S5 whenever Netflix airs Season 5. I will return to whatever season I was writing about as soon as I am done writing about S5. * Big changes as Piper goes from the SHU (Solitary Confinement) for beating up Doggett (Taryn Manning) to a new facility in Chicago. Ultimately, we find out that she has been sent to Chicago to testify in the trial of Alex Vause's drug cartel boss Kubra (Eyas Younis). * Another betrayal of Piper by Alex Vause (Laura Prepon). Thirsty Bird is a reference to a picture Piper made on the wall of her solitary cell that she made using her meal. 5. "I Demand To Know Where We Are Going"
During the coverage of Season One, I told the story of how, during transport, I was treated more like a dog than a human being. So, to be 100% honest, the Federal Marshal's treated Piper better than thousands of State prisoners are treated as they are transported to and from facilities across the country every day. One thing that was totally unrealistic was Piper's constant asking of every officer and every single inmate if they knew where they were headed. Every prisoner knows that officials won't tell you where you are going when you are being transported because it is seen as protection against being attacked in transit (they believe telling inmates a location would allow them to send that information to allies on the outside who might try to organize an escape plan). Yes, in case you were wondering, you never are told where you are going before you leave or while in transit, until you arrive at your destination. Piper would absolutely know this. I knew this before I left quarantine (which is the place you go when you first arrive and your security level is being determined). Also, the depiction of Piper trying to eat food and the spare nature of that food is pretty accurate. They do not uncuff you and you will most likely be eating a very terrible peanut butter sandwich. Lolly (Lori Petty) tells Piper that she left her watch, "back with her freedom," after Piper asked what time it was. Oddly enough, you can have, and wear, a watch in prison. At least in Michigan, you are allowed to purchase an approved watch from a state-approved vendor. Most everyone has a watch. I honestly cannot remember if you are allowed to wear the watch during transit, but you definitely can have a watch in prison. It is, however, unlikely Piper would continue to ask people so many annoying questions. The last thing anyone wants to do, especially when meeting new inmates, is to be continuously annoying. Piper seems surprised when she finds out that there is no door on the bathroom on the plane but in most facilities that I was in, where you did not have individual cells (where a single toilet is in the open of each cell) there were rarely doors on bathroom stalls (usually very low walls are on either side of each toilet and the front area is wide open). There is actually a very complicated bathroom etiquette in most of the facilities where I was housed. Often, at peak times, you have to wait in line to use a stall. While you are in that line, it is very important to NEVER appear to be looking at anyone in those stalls (sadly, I even know someone who got a broken jaw for staring at someone in a stall). At non-peak times, you can "save a stall" by putting your roll of toilet paper on one of the walls while you hang out by the showers (if there is no line). If there is a line, people sometimes try to use this method but it usually just pisses everyone else off. There are also very complicated rules for shower etiquette but we will probably cover that in some future episode. During "Thirsty Bird," Piper is housed in a mass cell at a higher security facility where the inmates stay in their cells for up to 23 hours a day. It really is true that the toilet in these kinds of cells (and in two-person cells) is right out in the open and that when people have to go #2 they do it right in front of everyone else (when you have to go, you have to go). Public pooping is one of many really uncomfortable part of being in prison and one that constantly reminds you that you are not a free person (and in a sense, not worthy of being accorded basic human dignity). Just as an FYI, when you are in a two-person cell, you try to arrange things so that you do your essential business when your "celly" is not in the cell. Thirsty Bird, for the first time, starts to give us real insight into Piper's backstory. Basically, Piper was a Daddy's girl and lived her life, in many ways, following her Father's guidelines and dictates. But, one day, while going to see a movie that she wasn't allowed to see (Dazed and Confused) under pressure from a friend, she saw her Father (Bill Hoag) kissing a woman (who wasn't her Mom). Piper decides to tell her Mother (Deborah Rush) but instead of getting mad at her Dad, her Mom gets mad at her (for going to see Dazed and Confused). Later in the episode, Alex begs Piper to not testify that she knows Kubra (she presents it as being for the safety of both of them but ultimately Alex is trying to get herself an early release deal for testifying at the expense of Piper). Piper, who wanted to testify honestly, decides instead to follow the path her Mother took with her Father (lie for love) and it backfires horribly. We also get some insight into Piper's character here. When her Mom refuses to stand up for herself and to confront her Father, Piper starts to rebel against her Father in her own clever ways. There is a moment where she tells a bus driver that her Father told her never to be a "lemming." In that moment, she interprets her Father's message as a reason to never follow the crowd into bad behaviors. After the cheating incident, and seeing her family live a quiet lie, she starts proactively searching out behaviors that other kids would never do. Later in the episode, we see that using and misleading her Father has become the centerpiece of their relationship. In other words, she is no lemming and she is still taking out her anger on her Father (even after so many years). 1. "You Must Have Really Pissed Off Whoever Put Those On"
Look, handcuffs and ankle cuffs are really uncomfortable. You may have some super comfy pair of cuffs you "play" with (maybe even with some comfy lining). Official cuffs are really uncomfortable, can really cut into your wrists and ankles, and you often have to wear them for hours and hours and hours. If you are in transit, you have to wear ankle and wrist cuffs for the entire journey, period. If you are a high-risk prisoner, you have to wear even more constrictive restraints (they have these wrist boxes that make it impossible for you to move your hands). It is absolutely accurate that if you spit at an officer they will put a plastic Hannibal Lecter mask on your face (they sometimes use a face mask with a bizarre kind of netting too). Officers are always looking for "new charges" to put on inmates, so it is also accurate that the officer would tell someone to add an assault charge to the jacket of the inmate who spits on him. In this case, the inmate was trying to transport a razor blade under her tongue but I have seen inmates snap for many legitimate reasons. You may think, why would someone spit at an officer (another thing that happens is inmates throwing feces...sad but true). My guess is that when you have no real means of having your grievances met (and the grievance process is onerous and complicated even for well-educated inmates) and you are constantly treated like an animal when you are angry you will start regressing to animal behaviors. Don't get me wrong, some people come into jails or prisons from the very start angry and acting insane. But, in fairness, our jails and prisons are the largest mental illness "treatment" centers in the entire country and many inmates are struggling with real mental problems. Even worse, most jails have a group of guards known as a goon-squad (who strangely all seem to have shaved heads, all look "roided" up, and who constantly wear black gloves). Goon-squads are sent in to deal with "troubled" inmates. Which usually means that when they do something like "spit" they are beaten down for it as they are restrained and placed in segregation (solitary). Anyway, cuffs are really uncomfortable and if the person putting them on is a sadist (and many of them are), they can be extremely painful. Also, and this is off-topic, I am guessing that Lolly assumed Piper was such a badass (because she told Lolly that she killed Doggett) that being friends with Piper would protect her from a beat down. In my experience, Lolly would know better (she was a long time inmate). Nobody protects you in prison (except for yourself). "What surprised you most about prison from my Season One coverage?" Leave a comment, let people know. Or, if you have questions, I respond to 100% of my comments! 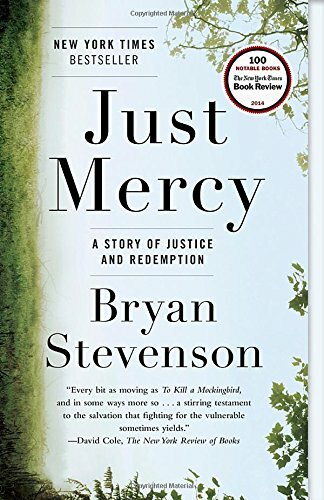 Today's book is Bryan Stevenson's book "Just Mercy."